It’s dandilion season. They’re blooming everywhere in great profusion. They’ll be around for the next three weeks or so then other wildflower will take its turn. 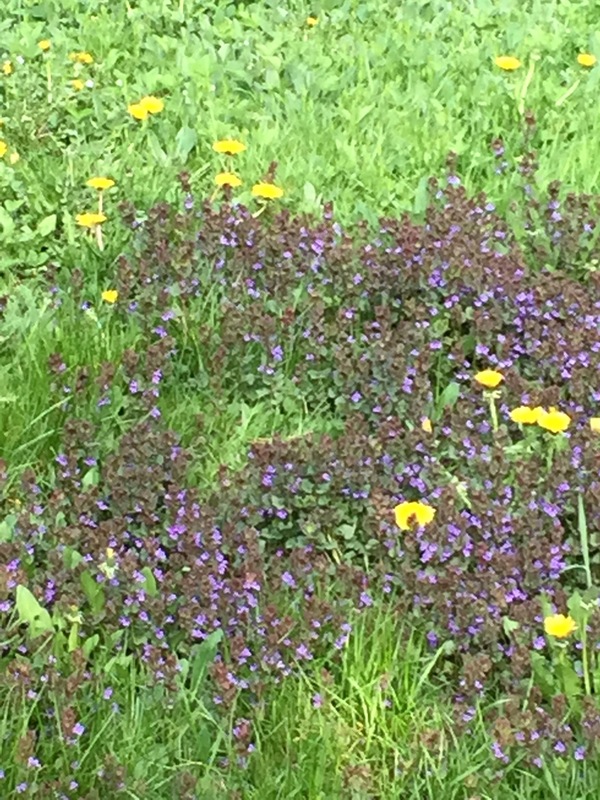 Since the city has banned the use of herbicides and pesticides I’ve had to dig the plants out individually, one at a time – it’s time consuming and hard on my back but it’s kept the dandilions at bay. 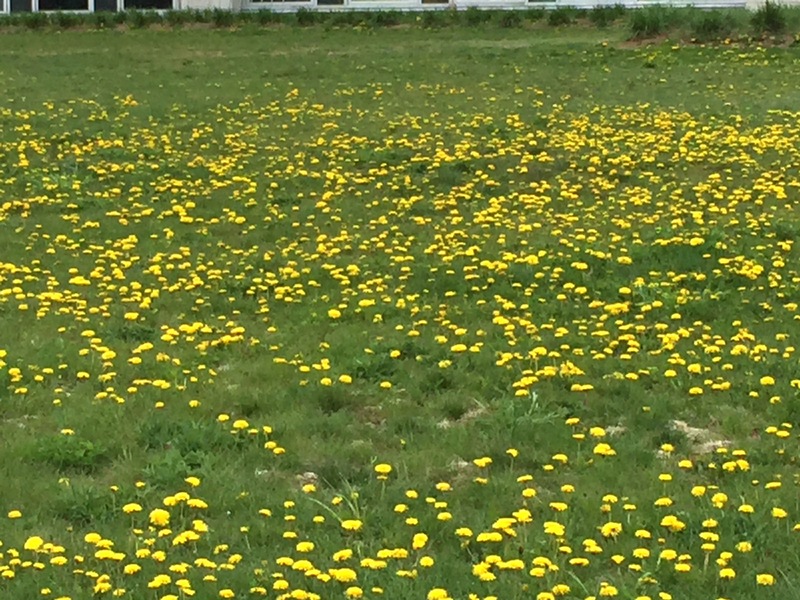 There’s rain in the forecast for tomorrow – I will have to put “dig out dandilions” on my Sunday “to do” list. I had about a metre and a half of Luella Doss’ Hot Flash – Juicy Blooms (HDLD01) fabric in my stash. I bought it 3-4 years ago and wasn’t sure what to do with it. From time to time I’d take it out and look at it, then put it back in the closet. 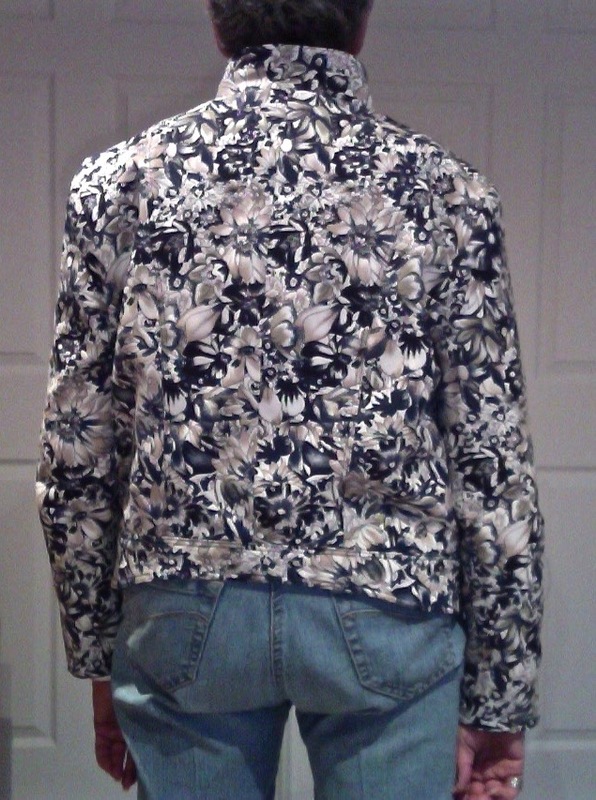 When I got back from San Francisco with the jean jacket pattern, I took the fabric out once again. I knew there wasn’t quite enough for the jacket pattern, but with a bit of contrasting twill (I decided to use black), I thought I could make it work. 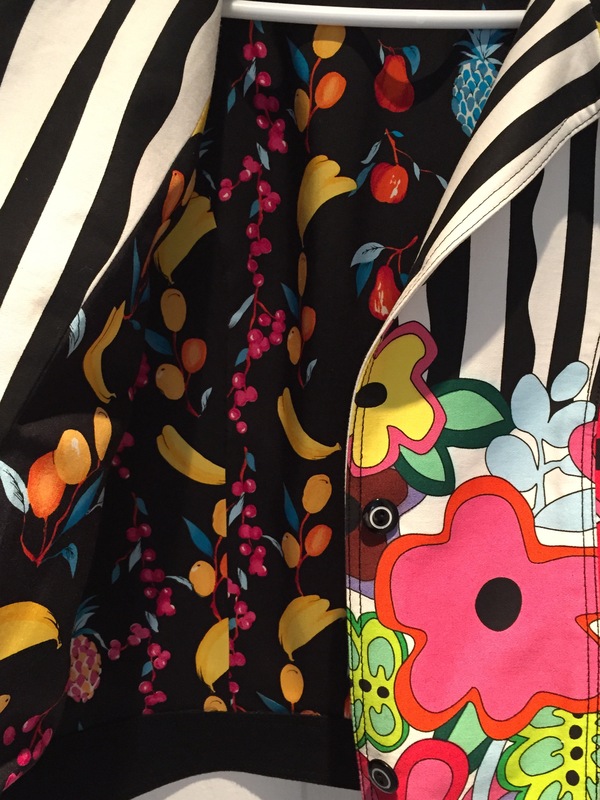 The challenge was the way the fabric was printed – flowers along one side, black and white stripes along the other. Straight off I knew I’d have to cut the jacket with the grain line on the width if I was to get flowers on the bottom and stripes at the top. 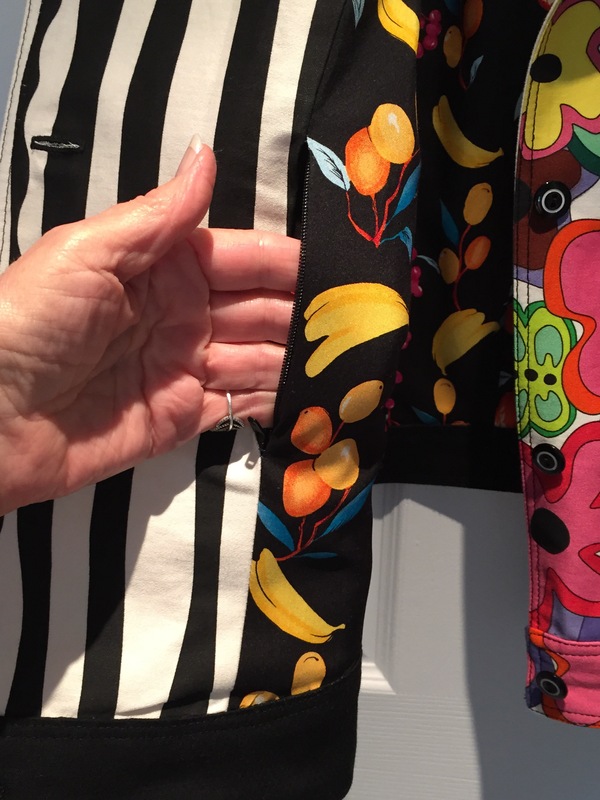 I didn’t have enough flower fabric to do all of the sleeve detail – so I decided to “mix & match” using flowers, stripes and black. I could only get one side of the collar and the bottom band pieces in the flower fabric, the facings had to be cut from black. 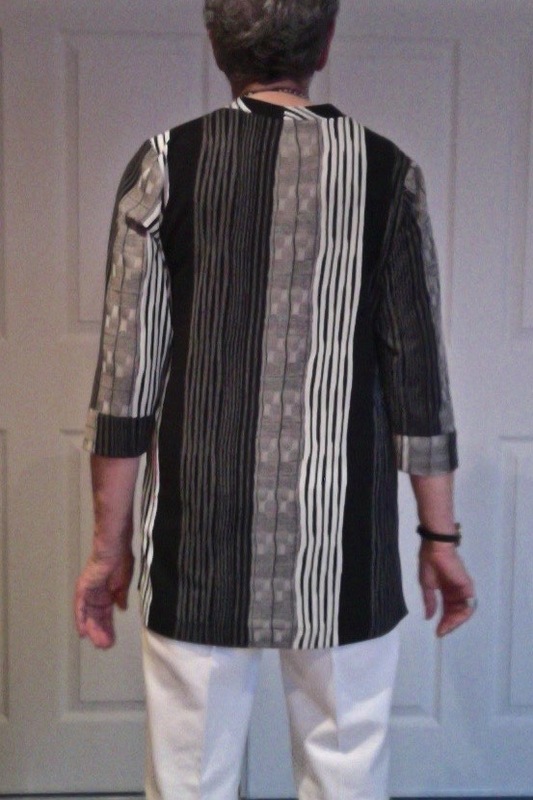 I also had enough of a perfect piece of black printed silk fabric for the lining which I’d bought in New York – I’d bought it intending to use it for lining, this seemed to be the right garment! So I cut the jacket out on Thursday, constructed the outside yesterday, built the lining (again with hidden zippered pockets in the lining), and put the whole together today. 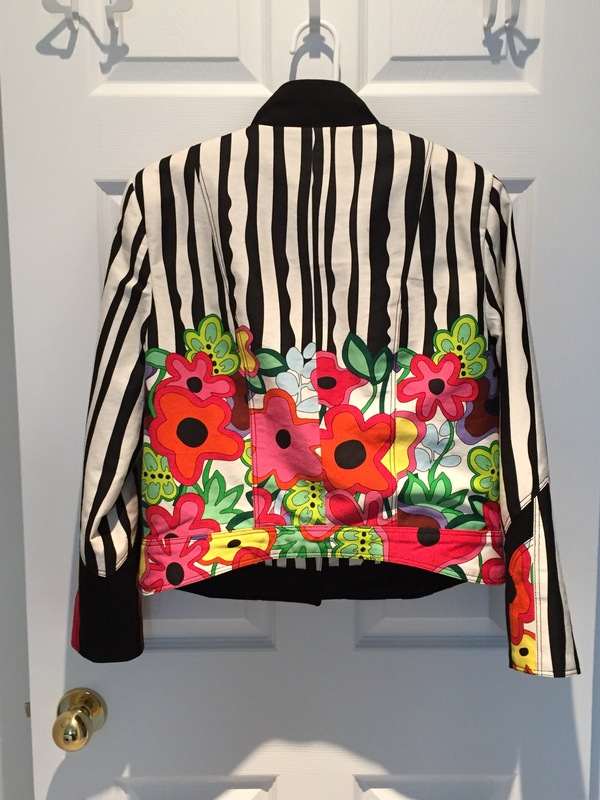 The jacket is definitely one of a kind! It’ll be fun wearing it. You get up one day and decide today is the day to swap out the winter pants for the summer ones. 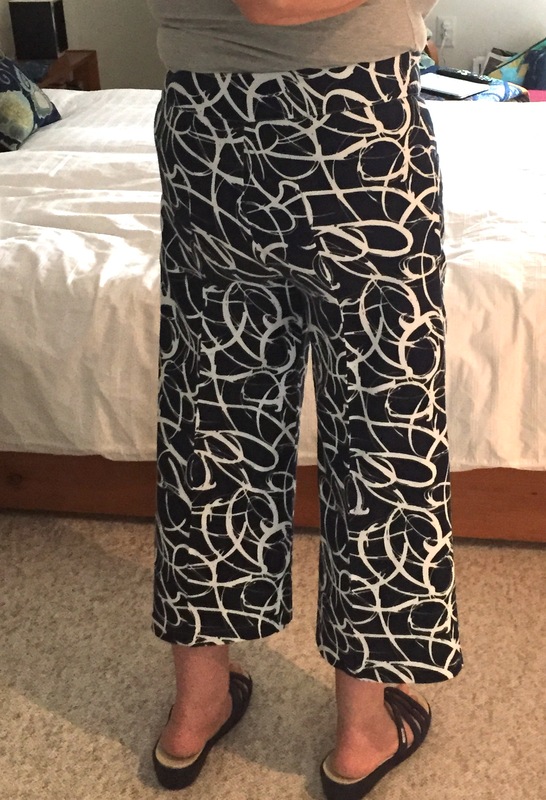 That was this morning – however, I knew I would want to do something with the fit in the back of all eight pairs of pants which I’d made last summer. I tried each on, pinned a dart to get rid of the fullness under the bum. Then I dug out some thin cardboard and drafted a template for the dart. 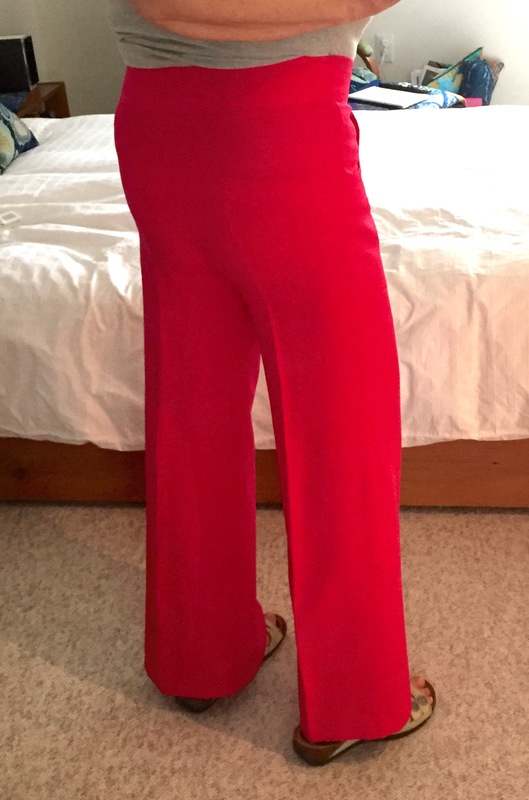 All of the pants were made from a palazzo pants pattern – with modifications as I went along – the legs got narrower, some ended up cropped, the first pair had the side opening used in the pattern, but second pair on I changed to a fly front. 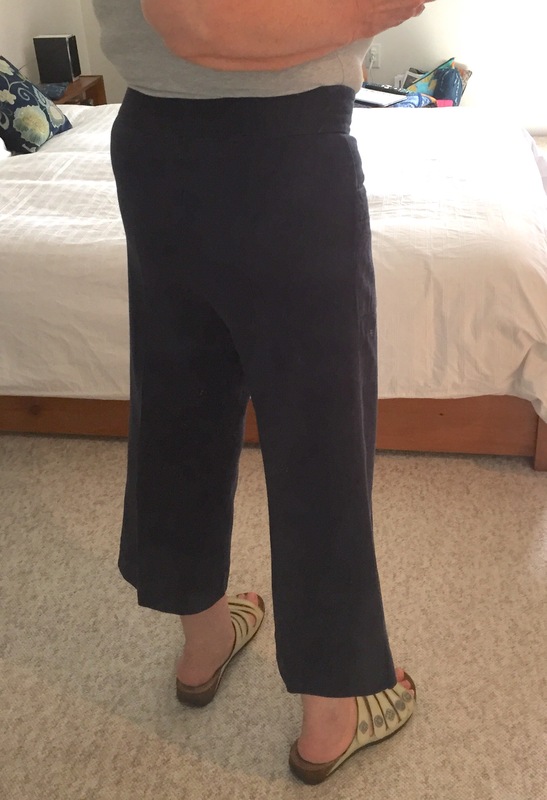 I figured out a system for doing the alteration – I turned the pants inside out, pressed along the centre back, marked 6.25″ from the lower waistband seam, positioned the template, marked the dart seam with a fabric marker or chalk, then stitched it. Pressed the dart toward the centre back, turned the pants right side out and pressed along the seam. Done! The pants fit so much better than they did. Now to incorporate the shape and depth of the dart into the back of my jeans pattern, as well as the palazzo pants pattern. I think I have the dimensions of the “dart” just about right now. 21 blocks done so far. Each block consists of six 2″ strips of a colour joined to a white; making a 9.5 X 9.5 block (finished size will be 9″ square). 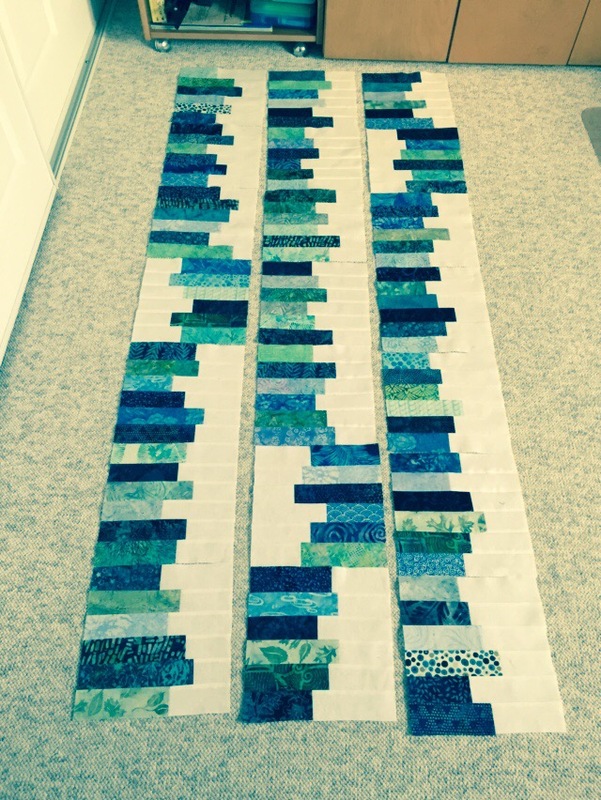 The strips for the remaining 14 blocks are stacked beside my machine ready to be assembled – this will be a 35 block quilt – finished size at least 45″ X 63″ – that’s without a narrow border which I may do. At the moment I’m thinking about reversing the direction of one block in each column for contrast, but if I do that I will want a narrow sashing (probably in white – not sure about that yet) between the columns. Until I am able to lay out all 35 blocks I can’t begin creating columns – since the design is still fluid. More to come. Haven’t given any thought to the back yet! 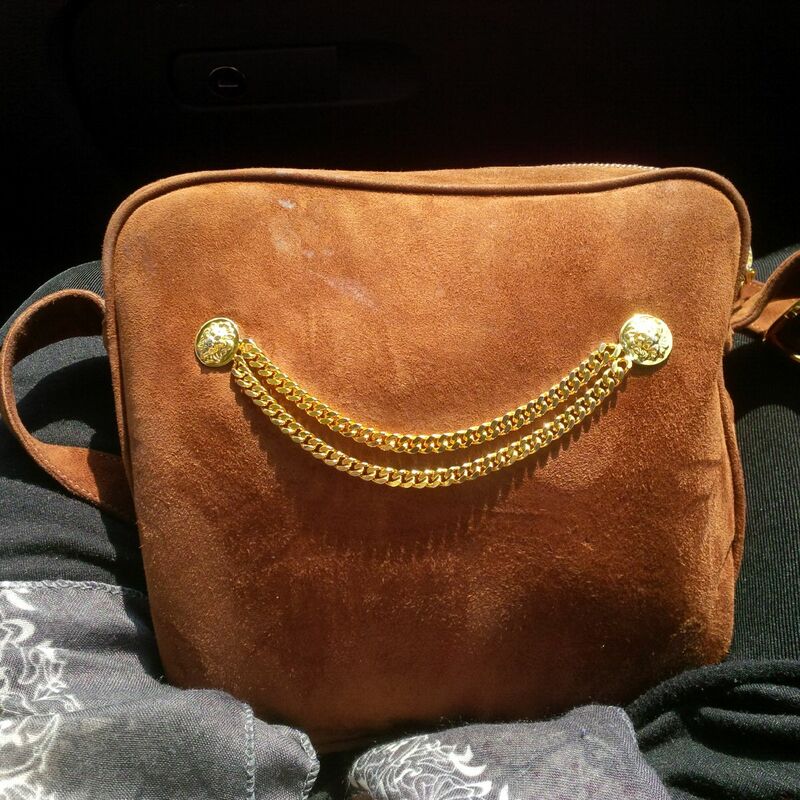 Once you start looking you see “faces” everywhere. 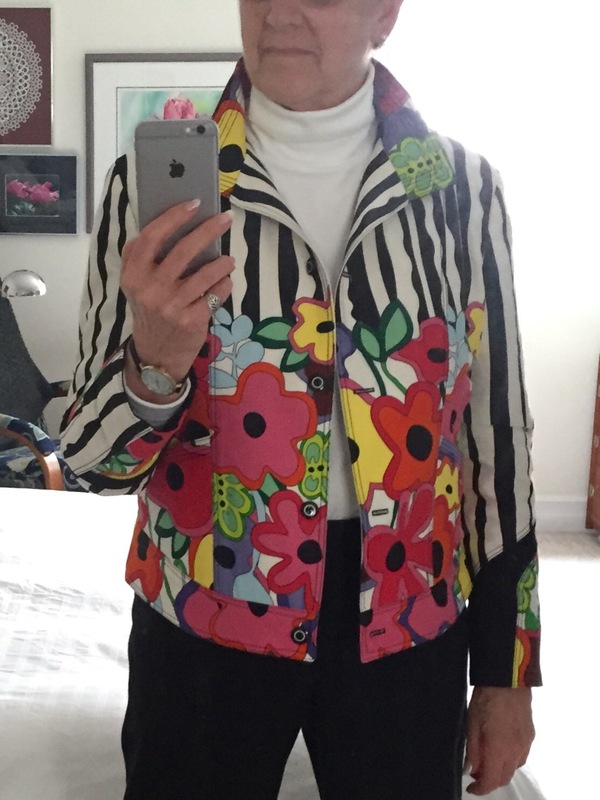 Just finished – Jean Jacket (Vogue 1036 – Today’s Fit/Sandra Betzina). A lot of detail, edge stitching and top stitching, lining, but not difficult to construct. I made a couple of modifications: In the original, the sleeves had a flare – I made the sleeve straight from elbow to wrist; the outside pockets are more decorative than useful (too shallow to hold my keys, for example), so I added two interior zippered pockets (credit card in one, cash in the other). The fabric is a cotton twill with a tiny bit of lycra (the bolt in the shop said “fabric content 100% unknown – as were all the other sample fabrics on display). 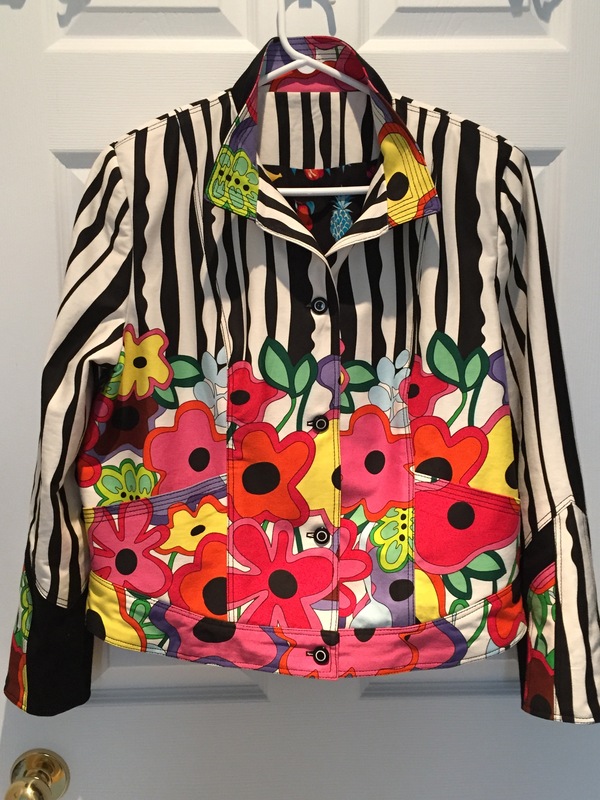 Great for a light spring jacket. 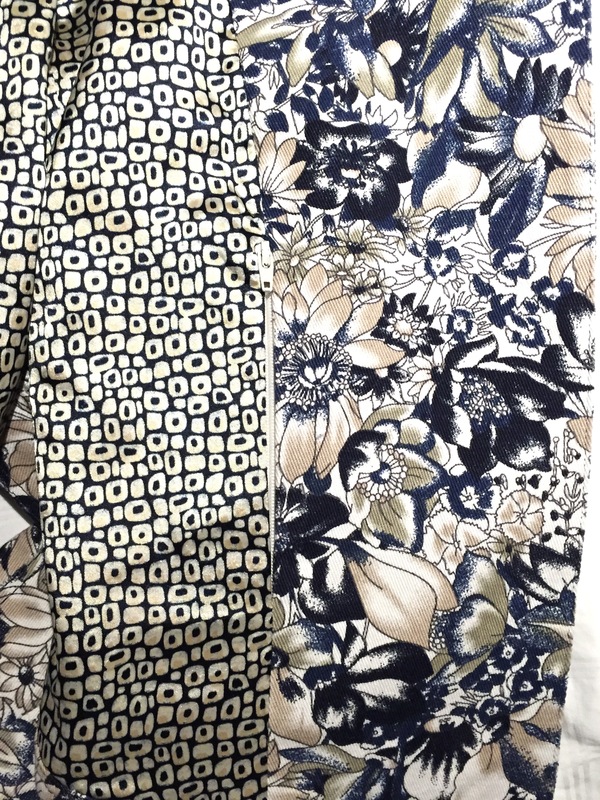 Oh, and Sandra suggests snaps for the front, I used buttons (I couldn’t find any heavy duty snaps in navy – all that was available in town were various metallic colours and I wanted the navy to blend with the flowers). 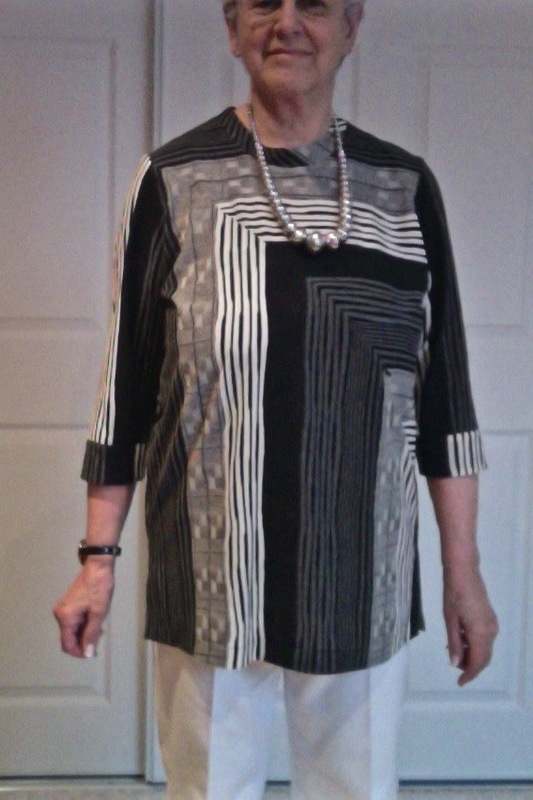 The fabric I bought in San Francisco – a striped knit. The pattern from Safe-T-Pockets T-Shirt Trifecta. I wanted the stripes to align on the diagonal seam and they did. Yeah! There is a small hidden pocket (with an invisible zipper) in the diagonal seam – that’s a trademark feature of all Safe-T-Pockets designs. This top will be a useful summer garment – with the white pants it’s both a casual or dressy outfit. Didn’t take long to whip it up. 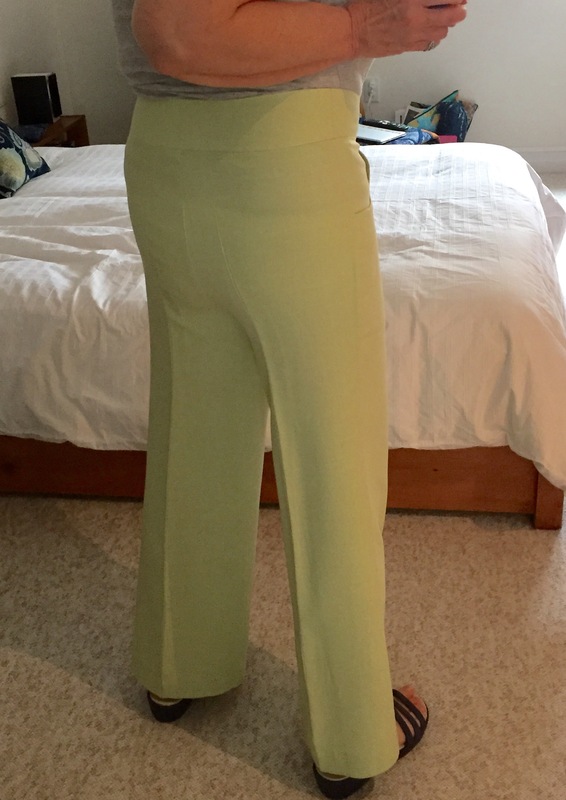 The neckband and cuffs intentionally add contrast just in case you thought I hadn’t planned that – I did.